Keep your FAL, M-14, or other 7.62 NATO/.308 Winchester rifle well fed with this 640 round case of NATO spec ammunition. These cartridges fire a 147 grain full metal jacket bullet at a muzzle velocity of 2,713 feet per second. 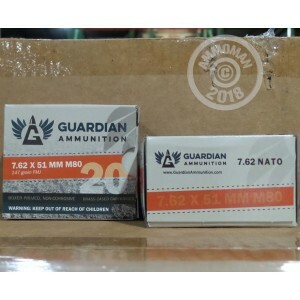 Guardian ammo is manufactured by MKE, a Turkish government company that primarily produces arms and ammunition for the Turkish military. It uses non-corrosive Boxer primers and reloadable brass cases. This case contains 32 boxes of 20 rounds each (640 total). Buy it at AmmoMan.com and get free shipping! Easy purchase, and appreciated the onetime verification. Free shipping and arrived on time. Put 160rds through C308. No issues at all, and relatively "clean". Round was not match, but much better than most bulk. Will get more soon. Shot very well in the M1A. I wish you had more in stock. I would purchase a lot more at the price. I think it was a great buy! Ammoman provides fast and reliable service with great prices. Shot 120 rounds in brand new AR, these were the 1st rounds fired thru it and never had a single jam, misfire or anything. These rounds are good. These are loose packed into small boxes of 20 each, with 32 boxes in the total package. The glue came undone on all of the boxes at some point during shipping or storage, and the rounds will spill out as soon as you pick a box if you are not careful. But its hard to complain at this price. You get what you pay for! Received the ammo in two days . Loaded the clip . 10 rds .Every shot was in a 1.5 group. My M1A NM. 1-11 twist. I had the weapon zero with ZQ-1. Guardian holds the same Zero. Will order 640 more next week. M1A Are Here to stay.